Hans-Erich Voss (or Voß, see ß) (30 October 1897 – 18 November 1969) was a German Vizeadmiral (vice admiral) and one of the final occupants of the Führerbunker during the battle of Berlin in 1945. He was also among the last people to see both Adolf Hitler and Joseph Goebbels alive before they committed suicide. Voss was born in Angermünde, Brandenburg on 30 October 1897. He graduated from the German Naval Academy in 1917. He served on in the Reichsmarine and later in the Kriegsmarine. In 1942, he was commander of the heavy cruiser Prinz Eugen, and met Joseph Goebbels, then Reich Propaganda Minister, when Goebbels accompanied a party of journalists on a tour of the ship. As a result of this meeting, Goebbels arranged to have Voss appointed Naval Liaison Officer to Hitler's headquarters in March 1943. Voss has the distinction of being presented with the 20 July 1944 wound badges in black, silver and gold. Voss was present during the bomb plot against Hitler on 20 July 1944. He was in the conference room at Hitler's Rastenburg Headquarters Wolfsschanze ("Wolf's Lair") as Kriegsmarine representative. Around 12:30 hours as the conference began, plotter Claus von Stauffenberg made an excuse to use a washroom in Wilhelm Keitel's office where he used pliers to crush the end of a pencil detonator inserted into a 1 kilogram (2.2 lb) block of plastic explosive wrapped in brown paper. The detonator, which consisted of a thin copper tube containing acid, took ten minutes to silently eat through wire holding back the firing pin from the percussion cap. The primed bomb was then placed in a briefcase under a table around which Hitler, Voss and more than 20 officers had gathered. Between 12:40 and 12:50 the bomb detonated, destroying the conference room. Although Hitler survived with minor wounds, three officers and a stenographer were fatally injured and died soon afterwards. Voss was also wounded in the bomb blast but he quickly recovered. He became a recipient of the Wound Badge of 20 July 1944. Initially his award class was presented in black but then it was upgraded to silver and finally gold because he was wounded a number of times after the initial award. Voss was the only member of the Wehrmacht to have received all three badges. In his capacity as Kriegsmarine Liaison Officer, Voss accompanied Hitler, Goebbels, and their entourages into the Führerbunker under the Reich Chancellery building in central Berlin in January 1945. In the final months of the Third Reich, Voss became a close confidante of Goebbels and his wife Magda Goebbels. He was aware that Goebbels had decided that they would not leave the bunker, but would kill their children and then themselves once Hitler was dead. "In Hitler's reception room at 10 o'clock in the morning there assembled Generals Burgdorf and Krebs, Admiral Voss, Hitler's personal pilot General Baur, Standartenführer Beetz, Obersturmbannführer Hegel, his personal servant Sturmbannführer Linge, Günsche and myself. He came out to us and said: 'I have decided to abandon this life. Thank you for your good and honest service. Try to escape from Berlin with the troops. I am staying here'. Saying goodbye he shook hands with each of us." "When Goebbels learned that Hitler had committed suicide, he was very depressed and said: 'It is a great pity that such a man is not with us any longer. But there is nothing to be done. For us, everything is lost now and the only way out left for us is the one which Hitler chose. I shall follow his example'." "Before the breakout from the bunker began, about ten generals and officers, including myself, went down individually to Goebbels's shelter to say goodbye. While saying goodbye I asked Goebbels to join us. But he replied: 'The captain must not leave his sinking ship. I have thought about it all and decided to stay here. I have nowhere to go because with little children I will not be able to make it'." "Vice-Admiral Voss, being asked how he identified the people as Goebbels, his wife and children, explained that he recognised the burnt body of the man as former Reichsminister Goebbels by the following signs: the shape of the head, the line of the mouth, the metal brace that Goebbels had on his right leg, his gold NSDAP badge and the burnt remains of his party uniform." 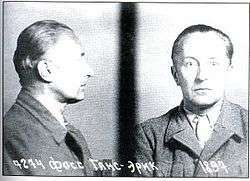 Voss was made a Soviet prisoner of war. In August 1951, he was prosecuted by the Soviet authorities on charges that "he held a command post in Hitler's war fleet, that was involved in an aggressive war in breach of international laws and treaties." In February 1952, the Court Martial of the Moscow Military District sentenced him to 25 years' imprisonment. By a decree of the Praesidium of the Supreme Soviet in December 1954, however, he was released and handed over to the German Democratic Republic authorities. Voss died at Berchtesgaden in Bavaria in 1969. ↑ Hoffman, Peter (1996). The History of the German Resistance, 1933-1945. McGill-Queen's Press. ISBN 0-7735-1531-3. ↑ Thomsett, Michael C. (1997). The German Opposition to Hitler: The Resistance, the Underground, and Assassination Plots, 1938-1945. McFarland. ISBN 0-7864-0372-1. V.K. Vinogradov and others, Hitler's Death: Russia's Last Great Secret from the Files of the KGB, Chaucer Press, 2005; ISBN 1-904449-13-1. J.R. Angolia, For Führer and Fatherland: Military Awards of the Third Reich, R. James Bender Publishing, 1987; ISBN 0-912138-14-9.